The Pipeline Leadership Award was created to recognize a distinguished individual, project or company for excellence in leadership and the implementation of innovative techniques and methods, proven on actual projects or process management to improve quality and integrity in the oil and gas pipeline industry, as well as to reduce the cost of construction, operation and maintenance. 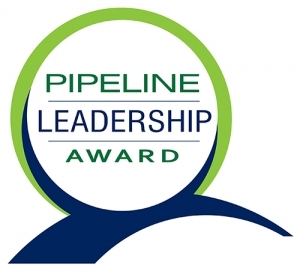 The Pipeline Leadership Award honors advances in the construction, operation and maintenance of oil and gas pipelines, including innovations in the construction process, design, procurement, contract administration, management, labor relations, training and safety that improve the global pipeline industry. The Pipeline Leadership Award also recognizes projects for their innovative concepts and methods. The Pipeline Leadership Award is presented at the Pipeline Leadership Conference, presented by Benjamin Media Inc., North American Oil & Gas Pipelines magazine and Continuum Capital. The Award winner is also featured on the cover of the November issue of North American Oil & Gas Pipelines, published by Benjamin Media.